Fifteen. 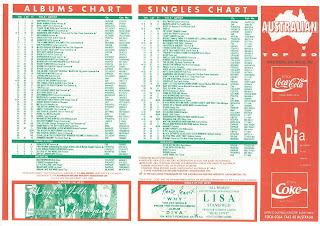 That's how many songs we have ahead of us in this week's flashback to the ARIA singles chart from 1992. OK, 13 songs and two EPs if you want to get picky! A number 2, a number 3, a number 4 and a number 5 - but which is which? ...including the song that was spending its fourth and final week on top: "Saltwater" by Julian Lennon. Let's get on with all the new songs, shall we? Spinal Tap were back in 1992 with all sorts of promotional activity around the Break Like The Wind album, but neither it nor this single fared very well in Australia. They'd defined disco in the late '70s and early '80s, but the band led by Bernard Edwards and Nile Rodgers didn't have any more chart good times with comeback album Chic-ism. While Bernard Sumner was making music with Electronic and Peter Hook was doing the same with Revenge, the other two members of New Order, husband and wife Stephen Morris and Gillian Gilbert, made sweet synthpop on their own. Featuring lead track "Out In The Open", this EP marked the end of the road for Nick Barker & The Reptiles, who were dissolved the following year. Included on the movie's second soundtrack album, The Commitments' version of Otis Redding's 1968 posthumous single peaked two places higher than The Black Crowes' remake had in 1991. Based around a sample from the Boney M version of "No Woman No Cry", this jaunty follow-up to "O.P.P." progressed no further than this debut position. In today's flashback to 1987, we saw Tina Turner rally after her previous ballad single had been a flop around Christmas 1986. Five years later, exactly the same thing happened. Released in December 1991, "Way Of The World" had completely missed the top 100, but Tina was back in the chart with the rockier "Love Thing", the third new song lifted from her Simply The Best retrospective. I have to say, "Love Thing" was no "What You Get Is What You See" - it was a fairly forgettable song that did well to get this high. They might have been enjoying a top 50 hit for the first time, but Killing Time's days were numbered. Within months, they'd have changed their name to Mantissa due to conflict with overseas bands also called Killing Time. 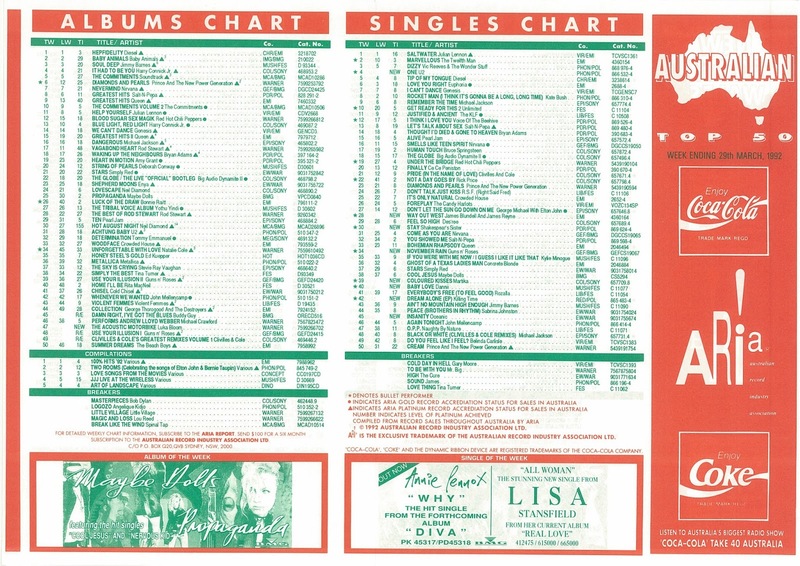 That issue aside, things were looking up for the Australian rock band as the Dream Alone EP took them into the top 30. Despite being the second song on the four-track EP and getting second billing on the front cover, "Dream Alone" got the most airplay and had a video that I no doubt fast forwarded through while watching the rage countdown. Remaking "Jump To The Beat" had turned out to be a good move for Dannii Minogue. The single turned things around for her on both the UK and, to a lesser extent, the Australian chart, so why not repeat the trick and raid the '80s for another dance/pop track? Originally released by Regina in 1986, "Baby Love" was co-written and produced by Madonna collaborator Stephen Bray - and almost sounded like it could've been recorded by Madge herself. Dannii gave the song a '90s spin - well, in-demand remixer Steve "Silk" Hurley" did - and it became her second biggest hit in Australia to date. While Dannii was on the way back up, fellow pop star Martika was on the way out, with this third single from Martika's Kitchen proving to be her final top 50 appearance in Australia. It was also her least successful top 50 hit, although "Water" had tanked even harder, limping to number 98 in 1990. Produced by Clivillés & Cole, "Coloured Kisses" was a good pop tune, but after the career-changing "Love... Thy Will Be Done" and the novelty factor of "Martika's Kitchen", it lacked that certain something to make it stand out from the crowd. A fourth single, "Safe In The Arms Of Love", was released in Europe, but this was it for Martika as far as Australia was concerned. The first of this week's four big hits was the latest from Guns n' Roses - a song that would go on to be considered as their magnum opus and wind up as the second highest-selling single of 1992 (and the 26th biggest of 1993) despite only reaching number 5. In fact, "November Rain" actually peaked at number 21 in its initial chart run, before disappearing for four months between May and September. When the nine-minute rock ballad returned, it quickly became a permanent fixture in the upper reaches of the chart, ultimately spending 24 weeks in the top 10. What brought it back? Oh, just one of the most expensive music videos ever made. The epic clip for "November Rain" featured singer Axl Rose getting married to his then-girlfriend, model Stephanie Seymour, and then attending her funeral. It was the second part of a trilogy of videos - starting with "Don't Cry" and ending with "Estranged". Fun facts: the song is the longest (in terms of running time) top 10 hit in the US (and presumably in Australia as well) and boasts the longest guitar solo. Here's another song with an iconic video - one in which Marcella Detroit represented life and Siobhan Fahey played death as they tussled over a bed-ridden, shirtless hunk. Directed by Sophie Muller, the clip for "Stay" was a huge part of the song's success, especially the bit where a demented, Joker-like Siobhan comes strutting down the stairs as the song really kicks in. One of those songs that was so different to everything else on the chart, it was always going to be massive, "Stay" gave the duo their biggest hit. In the UK, Shakespears Sister also achieved something Bananarama never managed there: a number 1 (for eight weeks). In recent years, John Williamson had single handedly represented Australian country music on the top 50 - and won himself three ARIA awards in the process. In 1991, it was young whippersnapper James Blundell who won the ARIA for his second album, Hand It Down, but he only spent a single week on the albums top 50. Outside the country world, most people would've had no idea who he was. That all changed when he teamed up with another James: Australian Crawl singer James Reyne, who'd been doing quite nicely with his solo career. The pair recorded a version of "Way Out West", originally released in 1973 by The Dingoes as their debut single. Not only did it raise James Blundell's profile considerably, but it was actually the biggest hit James Reyne ever achieved away from his former band. Having shown off their transformed sound with their previous two hits, U2 released a song more in-keeping with their '80s work as the third single from Achtung Baby. And "One" is cited as the song that kept the band intact when dissension about their new direction threatened to tear them apart during recording sessions for the album. A heartfelt ballad which Bono has said is a father-and-son story, "One" continued the band's streak of debuting in the top 5, although it would get no further than this first-week position. Three videos exist for the song - the initial running buffalo video, the actual Anton Corbjin video featuring the band members in drag, and the third and final version below, which is mis-labelled as the one shot by Anton. Next week: the flood of new entries continues with another seven debuts, including the first solo single from the frontwoman of an incredibly successful '80s duo and two instant top 10 hits from bands that'd taken their time to get going in Australia. The Madonna look-a-like in the Spinal Tap video was interesting. The Other Two was a clever name; 'Tasty Fish' less-so. If my memory of a forum post on popjustice is correct, the mix of 'Insanity' used in the video has never been released on CD. It's not the kind of music I normally listen to, but I've always liked 'Dream Alone'. 'Baby Love' was probably my favourite first-album era Dannii track. 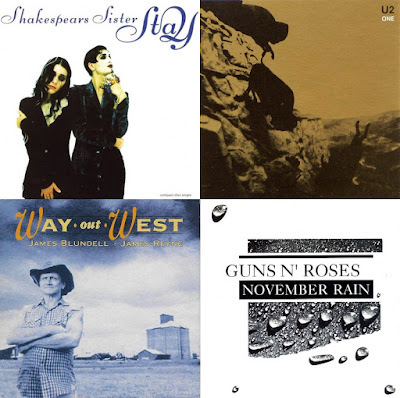 I can see 'November Rain's appeal, but it seemed to stick around forever, becoming grating. The 'shirtless hunk' in the 'Stay' video was none other than the father of Keren Woodward's son! The shock of seeing Siobhan made up like that is one of my most memorable music video moments. She downed a bottle of vodka before filming her part, and there’s an out-take of her tripping near the bottom of the stairs in the ‘My 16th Apology’ video. I loved the concept of Siobhan and Marcella hating each other played out through the 'Hormonally Yours'-era videos. Who would have thought that the girl from Bananarama could transform into this? I first heard 'Way Out West' performed live on TV, probably at the ARIAs that year. I found it rather embarrassingly bad with its 'la la la' chorus... so of course it went on to become a top 5 smash. I'm not a huge U2 fan, but have always liked 'One'. I liked the running buffalo video best. Rage aired that one when it was in the chart, but seem to have lost it since. The buffalo video for "One" was my favourite version as well. I'm not sure why, but its lack of action (mostly) made it interesting. I'd never seen the 'band in drag' version until now. "Drag the past out into the light" indeed!